The Chronoligical list for Verwood will gradually be expanded as a list of Verwood events in Chronological Order as time permits. The list has been split into shorter lists due to length. Please contact the Webmaster if you discover any errors or with any Significant event which you think should be included. Note that these may be on other sub-sites. The 2001 census put the population of Verwood at 12,069. The new guides "Verwood District Headquarters" was opened with a speech given by the district Commissioner Mrs Peggy Ganderton. Ray Reeks unveiled a plaque naming it "The Paddy Reeks Verwood Guide Headquarters" in memory of his wife, a guide leader for many years who had been instrumental in initiating and raising money for the new headquarters. Paddy sadly died before its completion. It is situated in Manor Road alongside the Scouts Headquarters. 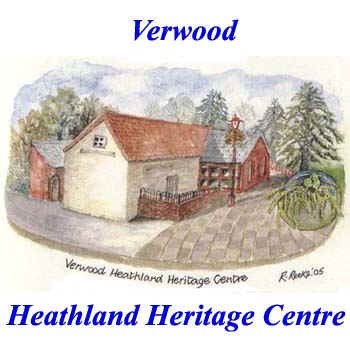 The Initial Phase of the Verwood Heathland Heritage Centre (museum and Coffee shop) was officially opened by the Rt. Hon, the Viscount Cranborne. Phase II of the Verwood Heathland Heritage Centre which was extended for further Exhibition Space and Research Centre, was opened by the Marquess of Salisbury (previously the Rt. Hon, the Viscount Cranborne). Verwood's Safeway's Supermarket becomes a Morrison's Supermarket. Verwood Town and the Twinning Association was awarded the European Diploma. The Verwood Day Centre in Dorset will provide services, including a multi-sensory room, for 25 people. Toni Coombs, local county councillor for Verwood, said: "I'm delighted that the centre is open. Hopkins Newsagents - The longest surviving shop in Verwood closes when its current owner Julian King Retired. Verwood & Three Legged Cross Twinning Association visit to to Liederbach in Germany - Report. The Rotary "Christmas Extravaganza" took place on Ferrett Green. - Select the info button for pictures. 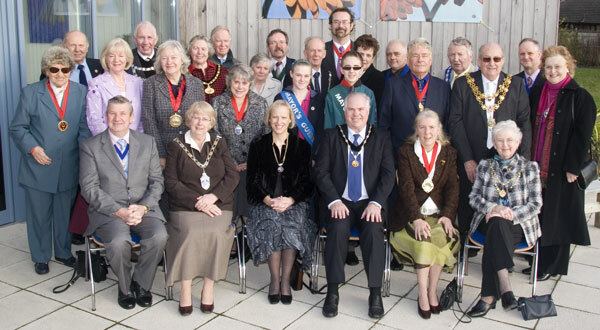 Local Mayors from the area at the Civic Function held in the Verwood Heathland Heritage Centre and the Memorial Hall. The Building of Verwood's new community Centre at Bakers Farm commenced. It became know as the HUB shortly after. The magnificent quilt made over a period of two years by the Crane Valley Quilters and donated to Verwood Memorial Hall, raised £470. Edna Cutler, aged 81 and one of the quilters, drew the raffle on 22nd February. Forest FM ("East Dorset's first Community Radio Station") broadcasting from Ebblake in Verwood had their Official Launch at 10 am Sunday when the Member of Parliament Chris Chope OBE, officially opened the station. The Heathland Heritage Heritage hosted the 1st "Tales at the Pottery event" as part of East Dorset Councils "Sting In The Tale" Festival of Stories with Michael O'Leary. "Classic Pam and Ron" - Retirement of Pam and Ron Reeks from the organisation of the Vintage Vehicles displays at the Rustic Fayre. The extension to the Three Legged Cross Recreation Ground was opened. "The Golden Oak" tree commemorating the Silver Jubilee of King George V & Queen Mary, planted by Harvey Sims (aged 5) and Lady Limpus in 1935, was removed in August 2006 for road improvements. 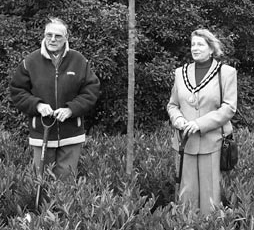 A new Japanese Oak replacement was planted by an older Mr Harvey Sims and the 2006/7 Mayor - Jane Russell. Harvey worked in the family building firm (Sims Brothers) based at Eastworth Farm all his life. 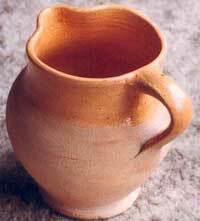 He was presented with a wooden bowl made by Chris Albray. The picture shows Mr Harvey Sims and the 2006/7 Verwood Mayor - Jane Russell. Mr Chris Cheesman, who was previously the Manager of the Barrington Centre in Ferndown, took up his post as the manager of The new Verwood HUB when it opened its doors for the first time. The new Verwood HUB is officially handed over to the Trustees by East Dorset District Council. (It has now become Lifestyle Verwood after extensions in 2013). "April Cottage" situated between the URC Church and the Heritage Centre was demolished for flats and shops. This site had previously been the site of the Crossroads Pottery Kiln and an Archeological dig was organised. Mr. Fred Thorne who worked at the pottery said that he made perfume pots for the London store of Liberty's, but there was no evidence, till one was found during this dig. For a full report (and pictures) on the twinning visit by our friends from Champtoceaux then please visit the Twinning Website. On the 50th anniversary of the European flag, through the Twinning Association, "Verwood & Three Legged Cross" was the only UK municipality in Europe to be awarded the "European Flag of Honour" in 2007 along with 23 others in Europe. Rushmoor in Hampshire was the only UK town to be awarded the "European Diploma" which "Verwood and Three Legged Cross" was awarded in 2005. Nuremberg won the overall 2007 "Europe Prize". East Dorset were invited in to run the Verwood Hub on a short term basis due to the retirement of the previous manager due to Ill health. Tracy Cooper became the temporary Marketing Manager. was published under the auspices of the Verwood Historical Society. A Special Fun Day was held in the Centre of Verwood to celebrate the awarding of the European Flag of Honour to Verwood & 3LX. A new manager was appointed to run the HUB taking over from the temporary management of EDDC. The new row of shops facing Ferrett Green and adjacent to the Heritage Centre is inaugurated with the opening of the new SPAR store. This was the site of April Cottage which previously had been the site of the kiln for the Crossroads Pottery. New finger post on Ferrett Green. "The Pavilion" in memory of Teresa Tanner (The Deputy Head who died of Cancer) was opened at Hillside 1st School. Allan Wells & Harold Foster from Verwood's Rotary Club presented a cheque for £500 (raised at the Rustic Fayre) as a contribution to the cost. 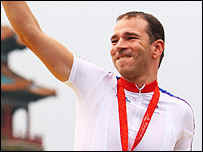 Verwood's record breaking paralympic cyclist Darren Kenny, who has cerebral palsy after an accident during a tour race has, since winning 1 silver and 2 gold medals at the Paralympics in Athens, gone on to increase his medal count at the Paralympics in Beijing with 1 Silver and 4 Gold Medals. Verwood Methodist Church Celebrates its 100 year anniversary. Well known resident Brian Hall died aged 77. Brian lived his entire life in the village/town, serving on the council and being involved in many local charities including the annual carnival. He was also a strong supporter and later president of Verwood "Rugby Union Football Club" as well as the local cricket club. He was also the owner of the the local Estate Agency that bore his name untill its sale. Verwoods New British Legion was threatened with Imminent Closure and attempts to revert to a British Legion Club allowed an initial stay of execution till December 31st. Verwood MemorialHall celebrates the Jubilee of its opening, It was opened on the 9th May 1959 after many years of gestation. Select here for an article on its history. Mr William Wells (who retired as a councillor in 1993) opened the new extension to Verwood Town Council's Offices to contain their help centre (which was originally opened in 1996). Attending the ceremony were Cllr Michael Dolan (Mayor), Cllr Mrs Pauline Reynolds (chairman of EDDC) and Mr John Wilson (chairman of DCC). Past members and their partners held a re-union in Verwood Methodist Church where they enjoyed a meal and presentation. Dorset Dignataries joined Verwoods Mayor Mike Dolan and residents for a civic service held in St. Michaels and All Angels church. They included the Deputy Loeutenant Professor Gillian Slater and her husband, Councillor Pauline Reynolds (chairman of EDDC) and mayors from Bridport, Chickerell, Ferndown, Gillingham, Lyme Regis, Poole, Portland, Ringwood, Shaftesbury, Swanage, Wareham, Weymouth and Portland, Wimborne and Yeovil. Chairman from Colehill, St. Leonards * St. Ives, and West Moors parish councils. Railway history was made when the first steam train ran from Swanage to London since the Swanage line was closed in 1966. The 11 coach train was pulled by "Tangmere", a Bullied Pacific steam locomotive which had been rescued from the Barry scrapyard in 1981; its long restoration was completed in 2003. Mayors Reception - Verwoods Mayor Cllr Mike Dolan and the Town Council welcomed dignitaries from the local areas with a visit to the Verwood Heathland Heritage Centre where they enjoyed an illustrated talk on the area given by Pam Reeks and later enjoyed a reception and meal in the Verwood HUB. 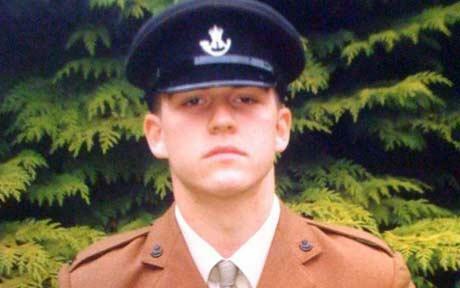 On tuesday the 8th Dec 2009 at 1 p.m. the funeral of Rifleman Philip Allen from Verwood took place in Wimborne Minster. The soldier who was 20 years old died in Afghanistan in November 2009 where he had been serving in Helmand Province when he was killed by an IED. He left behind his Family fiancee Karina. The Royal British Legion announces the sale of the Verwood Legion Branch which it is now planned to close in February 2010.